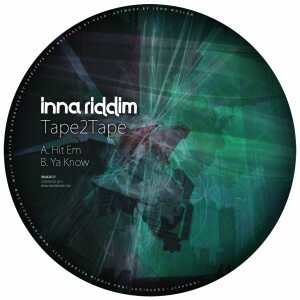 Tape2Tape enters the Inna Riddim dojo and his arrival is fixating like the final showdown between Bruce Lee and Bolo Yeung – a confident stride introduces a fury of riding 808s, striking with techno precision and topped with enough sub action to put both your feet firmly to work. No stranger to crowd-controlling and sound-crafting (having done so under his Ritual moniker for over a decade) Tape2Tape is an alias to liber- ate productions and ideas outside of the DNB realm he’s so well recognised for. So with every step into the future, chiming in with a familiar war cry, Inna Riddim fights alongside to deliver a combo of devastating blows for his release on Inna Riddim records. ‘Hit Em‘ is a cold, finely-crafted weapon of dancefloor destruction. The shimmering pads of the low-key, ominous intro plunge the tune into deep, moody atmospherics; then a metallic, textured sub rises up in a moment of calm before the insistent, staccato 808 kicks come in. It’s an automated abattoir of a tune that slashes a vocal sample into tiny pieces under a rhythmic tattoo as rapid and tightly controlled as a set of mechanised blades, dissecting and pulverising. ‘Ya Know‘ is a completely different beast: just as complex, but much warmer and looser, a block party of a tune. It opens with nothing but a tiny thread of noise like a wasp trapped under a jar and a pair of rever- berant kicks, quickly beefed up with a huge echoing snare and a rumble of toms into a tribal stormer of a beat, with a phased and delayed snippet of vocals that sets off the rhythm. But it’s all about the old skool synth, which infuses the tune with warmth and vivacity.